Hi everyone, Just wanted to give you an update. Something amazing happened this week, Griffin reached viability!!! Hurray!!! This means that If he is born early from this point on he has a chance at life, The Drs and nurse will fight to save him if he is born. I hope and pray everyday that we make it so much further than this but knowing he has a chance now, lifts a weight from my heart. Everyday he grows stronger, everyday he stays in my tummy he grows bigger and healthier and has a better chance at making it home safe and sound. This week at the ultrasound Griffin was sooo cute, he is actually starting to look like he is running out of room in there, and he's working on the cutest little pot belly! He was curled up head down in the fetal position with his arms and legs towards my right side, and his ankles crossed. I was wondering why I had been feeling him kick on the right side soooo much, and that explained it! My Dr appointment this week was full of needles. I had my regular weekly progesterone shot in my right hip and then I got the first of 2 shots of steroids (I went in Friday morning for the second one) which will help Griffin's lungs, intestines, and even heart mature faster in case he is born early. This shot went in my left hip, and ooohhh it stung! Also after much thought and discussion with the Dr we did decide to go ahead and have me get the swine flu vaccine, this one was in my right arm, and stung going in but wasn't so bad after that. 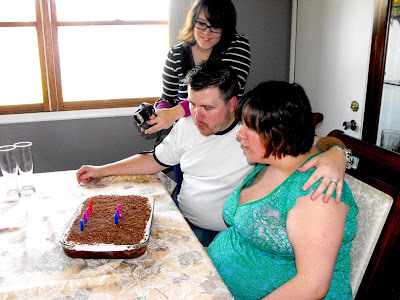 Things with my cervix were still nice and stable, and I got permission to go out with Jeremy to start our baby registry as long as I stayed in a wheelchair and kept it to one hour at time. I also finally got permission for Jeremy to take me out to dinner. So Friday afternoon Jeremy was set to take me out to start our registry and then that evening was going to take me out for dinner, but unfortunately none of it happened. I've been pretty paranoid about getting sick and my mom has been very good about trying to keep the germs away from me and making sure that everyone is washing their hands, but Friday I woke up with a cough, and Jeremy was actually coughing too. My dad and Lindsey have been sick (with flu like symptoms) for about the past two weeks. My dad wasn't getting better so my mom finally insisted on him going to the Dr. The news after testing, he has full blown swine flu. The Drs are taking it very seriously so everyone in the house was put on a prescription of a medicine called Tamiflu which is an antiviral, which will help prevent flu from taking hold, or reduce symptoms and severity if you are already sick. So since we were exposed and possibly infected with swine flu, (so much for the vaccine I got the day before) Jeremy and I decided to delay our trip until we saw how our health was over the weekend. So amazingly I am feeling really good right now, I took my first dose of tamiflu Friday evening and by the next day my cough was almost gone and I felt almost totally better, everyone else seems to be doing fine, and my dad is starting to feel better. Lindsey had the worst cough and ended up with another prescription for an inhaler and an antibiotic. Hopefully everything will be ok. If Jer and I are still doing fine by Tuesday he will take me to start our registry then, and out to dinner on Friday. So I'm looking forward to my first trip out of the house for something fun, in the last 6 weeks! Other than that I've started having some braxton hicks contractions which I'm told is normal but it still makes me nervous. They seem to happen more in the evening and especially when my bladder is full. I've been told if I start having a contraction once every 10 minutes to worry but if I just have a few at random intervals that I need not worry. I just want to tell my uterus to relax, it really doesn't need to "practice" yet! I also have permission to start birthing classes. They start this week, but we are still waiting to see if Jeremy can get Thursday nights off for the next couple of months so we can go. I'm supposed to do mostly observation, in other words no getting into birthing positions or doing anything that might stress my body or increase abdominal pressure. I can participate in breathing or any relaxation things and of course take full advantage of all the instruction and information we will be given. My tummy is starting to feel really big sometimes, and I'm loving it, although it does make it a bit harder to roll over in bed at night, lol. My hormones have been running a bit high this last week so I've been pretty emotional about everything, I don't know what I would do without Jeremy keeping me sane, grounded and cheered up when I'm sad or worried. He also did the sweetest thing this week he bought Griffin 2 outfits and 2 pairs of pajamas and gave them to me the morning Griffin reached 24 weeks as a happy 24 weeks present! And for being a guy, he did a really good job and picked out some really cool stuff. He also told me that when he ran out to get some groceries last week he saw a bear snowsuit, with little bear ears, and paws for hands and feet... so he is going to pick it up today. Our little Teddy Graham is going to have a bear snow suit, how cute is that! 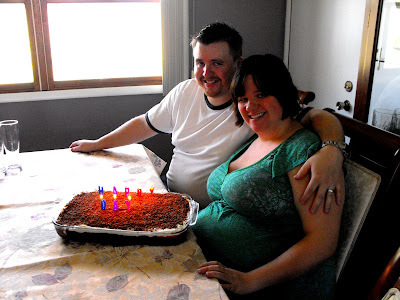 We also had a celebration cake on Saturday to commemorate Griffin reaching 24 weeks. My mom made a yummy chocolate forest cake, which is a made from scratch chocolate cake with cherries, whipped cream, and chocolate shavings on top... We had candles that said happy day and Jeremy and I blew them out together, it was so much fun. So that's the LONG update!